Rain and unseasonably cool temperatures didn’t keep Louisville from making the Rochester Institute of Technology’s (RIT) 31st Big Shot at Churchill Downs a success. 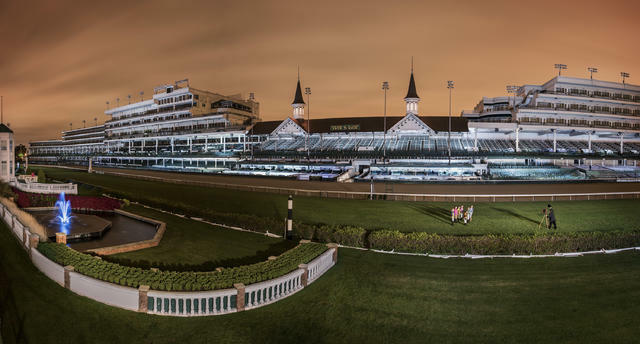 Local volunteers, RIT students and local RIT alumni used flashlights and other handheld devices as the primary light source to illuminate the famous Twin Spires while RIT photographers shot an extended exposure photograph of Churchill Downs clubhouse. This year’s final image was a 30-second exposure at f11 (ISO 100). The Big Shot is often described as “painting with light” because participants are asked to “paint” or shine their light source on a particular area of a landmark while the photograph is taken. Participants were tasked with continuously painting an assigned area of Churchill Downs while RIT photographers – perched above the infield and facing the historic twin spires and famous Kentucky Derby winner’s circle – shot an extended exposure. The photo was taken at 9:09 p.m. ET. The Big Shot event began as a way for RIT’s nationally recognized School of Photographic Arts and Sciences to teach students about flash photography. Since it was founded in 1987, university photographers have captured iconic landmarks including AT&T Stadium (formerly Cowboys Stadium) in Arlington, Texas; The Alamo, San Antonio, Texas; and the Royal Palace, Stockholm, Sweden. To view the nighttime images of all Big Shot subjects, go to www.rit.edu/bigshot. Longtime Big Shot sponsor Nikon Inc. was among the corporate supporters again this year, loaning high-end photographic equipment for the event. Volunteers of the free, public event received instructions on how to download a digital copy of the finished photo and a free general admission voucher to Churchill Downs’ Fall Meet Nov. 1-29. Rochester Institute of Technology is home to leading creators, entrepreneurs, innovators and researchers. Founded in 1829, RIT enrolls 18,600 students in more than 200 career-oriented and professional programs, making it among the largest private universities in the U.S. The university is internationally recognized and ranked for academic leadership in business, computing, engineering, imaging science, liberal arts, sustainability, and fine and applied arts. RIT also offers unparalleled support services for deaf and hard-of-hearing students. The cooperative education program is one of the oldest and largest in the nation. Global partnerships include campuses in Croatia, Dubai and Kosovo. For news, photos and videos, go to www.rit.edu/news.